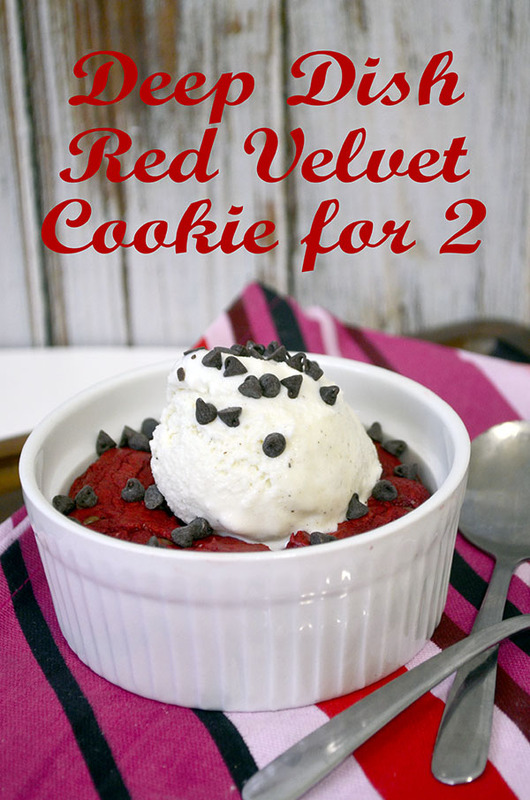 Do you ever want a yummy treat that is just the right portion to share with someone? 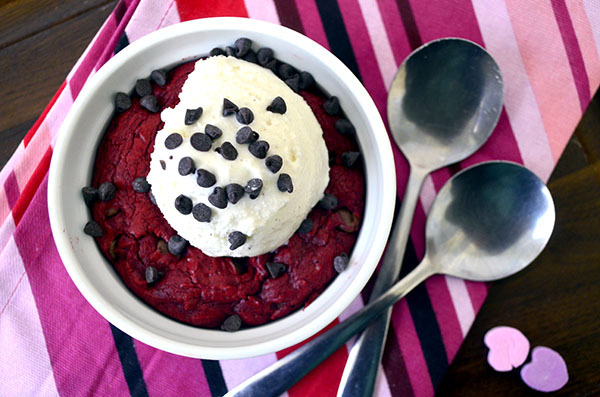 Today I have a delicious Deep Dish Red Velvet Cookie for two!! This cookie is loaded with melty gooey chocolate chips! Your going to want to eat it warm, let it cool just a bit then top it with ice cream or fresh whipped cream! Oh my its so good!! I was going to put colorful sprinkles on top but I decided on mini chocolate chips instead! Maybe I should have done both?? Nah I think it was the right choice! This recipe is one you will want to make again and again!! 1/4 cup unsalted butter, softened to room temperature. Preheat your oven to 350 degrees F. Mix together dry ingredients: flour, cocoa powder, baking soda, and salt. Set this aside. Cream room temperature butter until fluffy - about 1 minute. Add in dark brown sugar and granulated sugar. Beat until light and fluffy, add in an egg yolk, buttermilk, vanilla extract, and red food coloring (start with a couple drops and keep adding until desired color has been reached - I used gel food coloring and I think I used about 15 drops). Mix until combined, scrape down the sides and the bottom of the bowl to ensure that everything has been fully incorporated. Stir in semi-sweet chocolate chips. Cover bowl and let rest in the refrigerator for about an hour. Once the dough has chilled, grease two ramekins and fill with the cookie dough. Make sure to press the dough down gently evenly spread throughout the ramekin. Bake for 15-20 minutes. Or when a toothpick inserted in center of cookie comes out clean of dough. 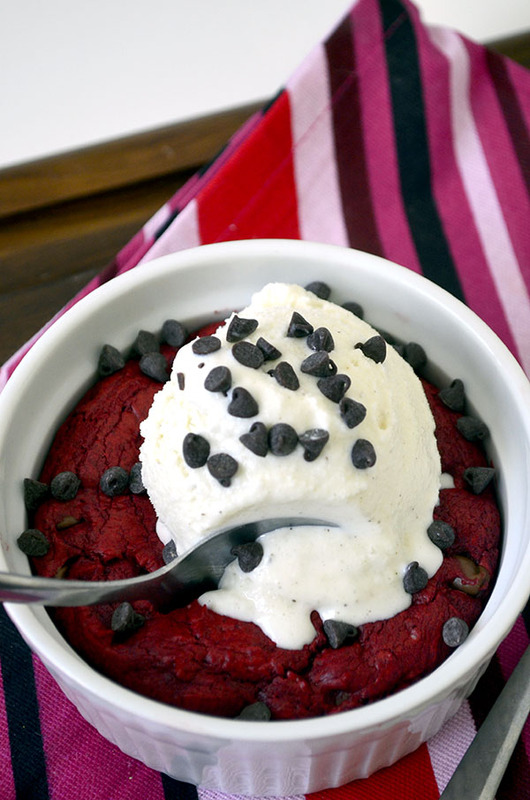 Remove from the oven and let cool slightly, before topping with ice cream and chocolate syrup! 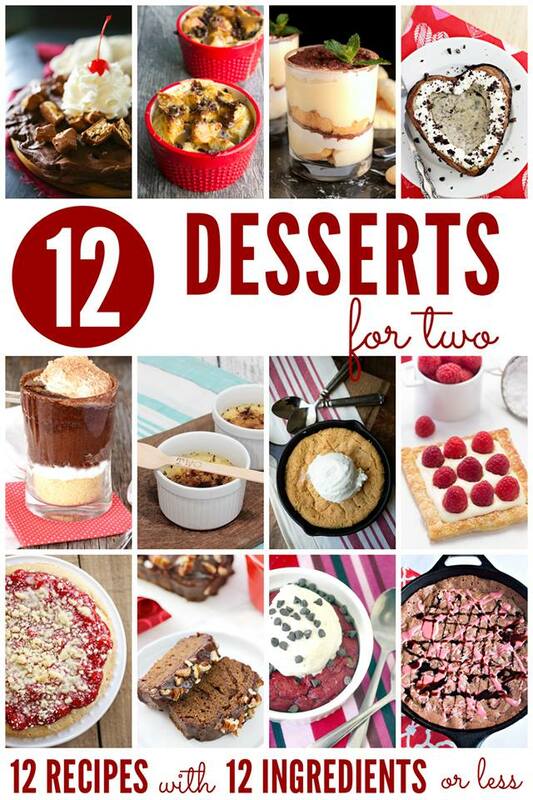 If your looking for more yummy desserts for two take a peek at these from some of my favorite bloggy friends!